Underused in Australian gardens, Ajuga australis which is commonly known as the Austral Bugle. This is on of two Ajuga species found in Australia. Found widely of South Eastern Australian, from Brisbane to Adelaide this is a low groaning perennial which makes a great ground cover plant. Mauve flowers from summer through to autumn appear on spikes above the foliage. Foliage itself is a mid to deep green with a soft velvety texture, and Ajuga australis will grow well inapt shade, however it tolerates full sun as well. Ajuga australis is well suited for use beneath taller trees as a flowering ground cover plant. Also useful in a cottage garden or in a rock garden, and well suited to planting beneath taller shrubs in containers. When using as a ground cover, plant at around 80 cm apart to form a quick dense cover. It is a useful plant for erosion control and will grow in semi shaded areas. Ajuga australis is a drought tolerant plant once established and copes well with a range of soil types. Mulch around plants to maintain some moisture and control weeds as the plant establishes itself. Over time it will form a dense matt. Common Names – Aussie Bugle, Australian Bugle or Austral Bugle. Position – Light shade to part shade. Flowers – Mauve on spikes to 15cm. Pink and white flowering forms are also found. Foliage – Mid green, toothed with a soft texture. 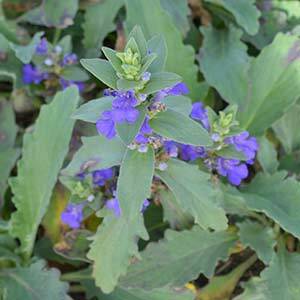 Ajuga australis is available for sale from the following participating nurseries.